One of the most interesting aspects of roster construction in today’s major league baseball is the bullpen , and how it revolves around the closer. The closer position has reached mythical status in today’s MLB, exemplified by Mariano Rivera. Since 1996, the game for the Yankees has been to find a way to lead after eight innings, and then to turn the ball over to the undisputed best one-inning pitcher in the history of the game. Rivera may rank behind Trevor Hoffman in terms of career saves, but Mo’s 14 year span of dominance is unprecedented. And yet, he only ranks 76th on Sean Smith’s list of pitchers by WAR. Hoffman is all the way down at number 209. For me, the idea that a role with such a seemingly low value can be placed in such a high regard evokes some sort of curiosity. Today, we look at how the position of the closer has evolved since the inception of the save, the statistic which will be forever linked with the closer. The save was introduced in 1969, but the idea of the one-inning closer which we are so familiar with did not immediately catch on. Goose Gossage, for instance, is specifically noted as having the ability to earn a multiple-inning save with regularity. In today’s game, on the other hand, it is an event when a closer is called upon to make a two-inning save. Let’s take a look at the average innings per game finished for those pitchers with 30 saves or more since 1969. 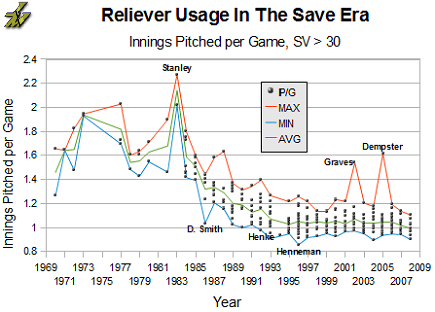 Games is used instead of saves to account for blown saves as well as games entered that weren’t save situations. Two things jump out right away. First, the sheer numbers of 30 save guys ballooned in the 90s and the new millennium. Second, as we already knew, for the most part, “closers” pitched many more innings in the early parts of what we can call the “Save Era.” The correlation between IP per game is high, with R^2 = .56. We especially see this decline around 1986, when the average IP/G for these players drops from 1.51 to 1.32. Tom Henke’s 34 save season in 1992, in which he pitched 57 games and 55 2/3 innings, was the first 30+ save season with less than 1 IP/G. Things have been relatively constant since the strike of 1994. From 1995-2008, the average IP/G for 30 save closers ranged from 1.03-1.07, with only two pitchers (Danny Graves in 2002 and Ryan Dempster in 2005) going over 1.25. The role of the closer has now been quite well-defined, and the Goose Gossage style of pitcher is dead. Here, we can see the undeniable effect that the save has had on the game of baseball. The way teams build rosters is different. The way managers attack game strategy is altered. The market for relief pitchers has changed. Between these and other changes, we’ve seen one simple statistic dramatically effect the way the game is played. We hoped you liked reading On the Closer Position: The Save and RP Usage by Jack Moore! Why Should We Care About the Hall? The worst statistic ever invented.